Home»Forums»Help With Everything Else:»Wide-Open Forum»Virgo Babies! Virgo born babes. I know more Virgo's amongst family and friends than any other sign. The two closest would be my sister and also mini me. Could it be due to the sign falling in the 9th month? A cold winter! or Fate amongst the Gods? Let's celebrate the Virgo's amongst us this month. Who are ya' now? You do not need to provide an exact date if you wish. The Truth Is Out There. Trust No One! Deny Everything! You're upsetting me....on several levels. My mom is a Virgo! Sept. 15th. 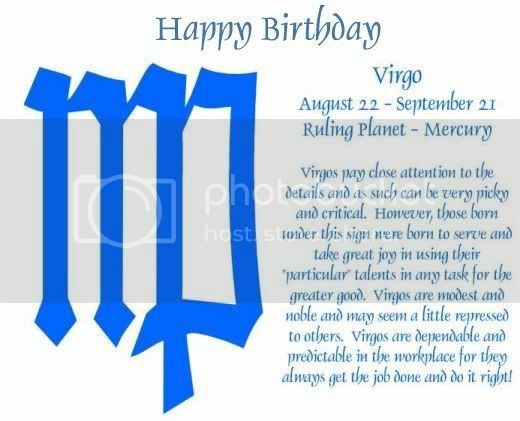 My double aka my lil sis is a Virgo, Happy Bday my love (even though she won't read this), also my lil bro-in-law, my lil-sis-in-law (tuna's mini),my good friend Nick, and I hope I'm not forgetting anybody else...HAPPY BIRTHDAY VIRGO BABIES!! -Pain is weakness leaving the body- USMC OOrah! I'm 9/1 and my brother is 8/27. I am 360 days older than him. Me too!! August 23, and I've had a lot of them!! My youngest grandson's is September 18.
have we missed any Virgo and/or September babies? Tuna ><(((( '> the other white meat!